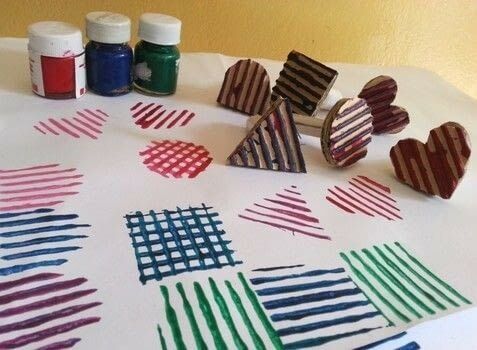 A great way to make stamps using old cardboard. You can use these stamps for a number of other projects. Have fun! Print out some easy and simple shapes and cut them out of the paper. Place the cutout shapes or patterns on a piece of cardboard and trace around the edges. Draw 2 (similar) shapes for each stamp. 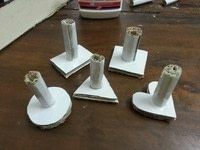 Now cut the shapes out of the cardboard using a scissor. 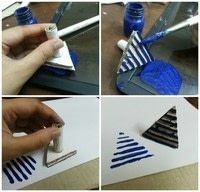 Use 2 pieces of cardboard for each stamp to make it thicker. Glue one cutout shape over the other one (similar shapes). After the glue dries carefully remove the top thin layer of cardboard to get the stripes out. Take a small piece of cardboard to make the handle, I cut out a 2 X 1.5 inch cardboard piece. 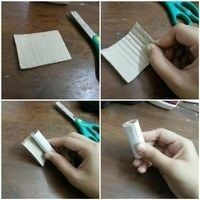 Now roll it as shown in the picture and glue the sides (I used clear scotch tape). Now simply attach the handle on the back side of the stamp shapes using glue. I used fabric paint for stamping. Take something with a plain surface to pour paint on it. 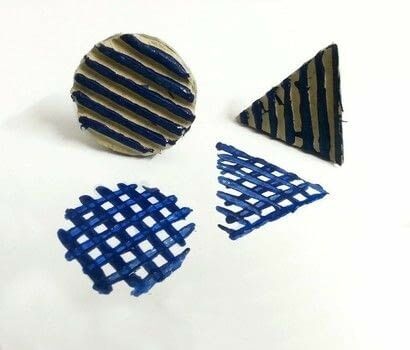 Now, place the cardboard shape stamp on the paint and make sure every stripe is covered with paint or you can also use a paint brush to cover the stripes with paint. Now start stamping! You can rotate some shapes (triangle, circle, square) to create a checked pattern. Enjoy!